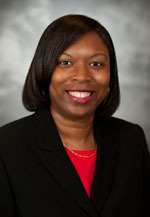 Assistant Professor for the College of Law Dr. Tracey Carter recently had an article, titled “From Youth Sports to Collegiate Athletics to Professional Leagues: Is There Really “Informed Consent” by Athletes Regarding Sports-Related Concussions,” published in the University of Missouri-Kansas City Law Review’s Winter 2015 edition. She also presented her research on during a meeting hosted by the College of Law’s Faculty Development Committee. Carter’s article highlights the health problem of sports-related brain injuries, especially football-related concussions, in the United States. The article emphasizes the serious problem of sports-related concussions and addresses whether youth, collegiate and professional athletes are really “informed” regarding sports-related concussions. Carter concludes with recommendations to better protect athletes and to decrease the number of sports-related concussions and ensure the best outcomes for athletes, families, youth sports, collegiate teams, professional leagues and society.